A proposed bill filed at the Arkansas state capitol would compel Arkansas public school districts to develop Bible-based curricula. Allegedly, the bill as it presently stands would not compel schools to implement such curricula in the classroom, but many questions remain regarding its constitutionality. The case illustrates one of the latest attempts by conservative lawmakers to insinuate religion into government by contesting the meaning of the Establishment Clause of the First Amendment to the U.S. Constitution. However, there are at least two problems with the argument offered by the bill’s supporters: first, the Bible cannot be treated as an actual history book, and second, there is strong evidence that the Establishment Clause was in fact intended to keep religion out of government. The unfunded bill, which was pre-filed by Senator Denny Altes, is competing with others for consideration in next year’s crammed legislative session in Arkansas, raising doubts among some lawmakers as to its importance. Compounding the bill’s relative unimportance are questions about its constitutionality and whether or not it blurs the boundary between church and state. According to the bill, the Protestant Christian version of the Bible would be taught to students as a work of literature from a detached, objective perspective, and not with the intent of advocating Biblical beliefs. Still, in light of the more pressing concerns of tight budgets and economic problems, the bill is not a priority for many lawmakers. One of the arguments used by the bill’s supporters is that the Bible is the world’s most popular history book, therefore it should be treated as a valid academic text in schools. According to B.J. Steed of Little Rock’s KTHV broadcasting corporation, Altes told the media, “We’ve got the world’s most popular history book and we’re not using it in the classroom.” The claim that the Bible is popular, and therefore should be taken seriously, constitutes a fallacy known as argumentum ad numerum, or “appeal to popularity”. That a belief is popular does not mean it is correct, because a belief can be popular and still be incorrect. For example, it is popularly believed among right-wing, evangelical Christians that the first woman was created from the rib of the first man, yet biologists and anthropologists can refute this claim with our current understanding of how human beings are created. In turn, the claim that the Bible is a history book can also be refuted with this proof, because an historical event is impossible if it defies the laws of nature, as in the story of Eve’s creation. So, no, the Bible cannot be deemed a valid source of history for public school education. Here we see Jefferson use the words church and religion synonymously. 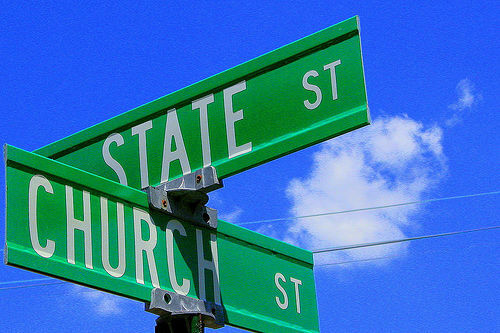 The famous phrase “thus building a wall of separation between church and state” is introduced by the claim that the role of government does not extend to opinions based on religion. He repeats this reference to religion in the following sentence, stating quite clearly that it is acts respecting religion which Congress should be inhibited from. (The italicized, bracketed text was blocked out by Jefferson so as not to offend his Republican peers from the eastern states, as he explained in the letter’s margin.) And we know that during his tenure as ambassador to France, Jefferson did influence the drafting of the Bill of Rights, since he wrote a 1789 letter to James Madison exhorting him to support it; Madison presented a package of twelve proposed constitutional amendments only three months later. All of this would apply to individual state legislatures too, since Jefferson refers to the legitimate acts of a generic “government”. Given these facts, it seems reasonably straightforward that the purpose of the Establishment Clause in the minds of its conceivers was to keep religion out of government. 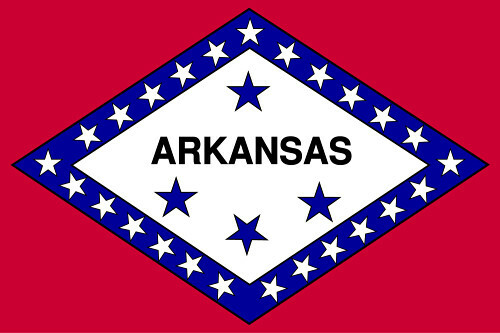 Supporters of Arkansas’s proposed bill will likely exploit any loophole they can find to get the bill passed, despite the strength of the opposing arguments, but interfaith online churches such as Universal Life Church Monastery that believe strongly in the separation of church and state can at least count on the possibility that it will be pushed to the side as economic and budget considerations take precedence. We are always happy to hear back from our legally ordained ministers. Tell us what you think. Should the Arkansas legislature pass a bill requiring public schools to develop Bible-based curricula?